There are two types of academic ghost-writing that have been established in academic circles. First, sometimes, research assistants or PhD students write entire research articles and conferences presentations for their professors and do not receive credit for their work. Other academics do not prepare presentations for lectures and seminars, rather they have their students do that. Sadly, students are surely conscious of this phenomenon yet pursue to conform. Secondly, legitimizing their own inability to create a research paper, as their supervisors might do the same, the students engage in the very same behaviour. Due to tense deadlines and an enormous work overload, some see themselves forced to engage in the illegal behaviour. This is the niche where ghost-writing agencies have established themselves. They promise the student to write their manuscript in exchange for remuneration. The responsibility, how else could it be, lies on the students’ side. 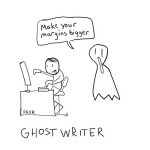 Ghost-writing agencies deliver their manuscript and if the student uses it without any correction, they claim to only having given advice to the student. Agencies publishing their announcements on various university websites, promise to help in the chaos of essays, research papers and theses. Yet, it’s illegal, not to mention extremely expensive. Enough students seem to need ghost-writers so much that the ghost-writing agencies can charge as much as 10.000€ for a creation of a dissertation. Who are those ghost creating academic papers? 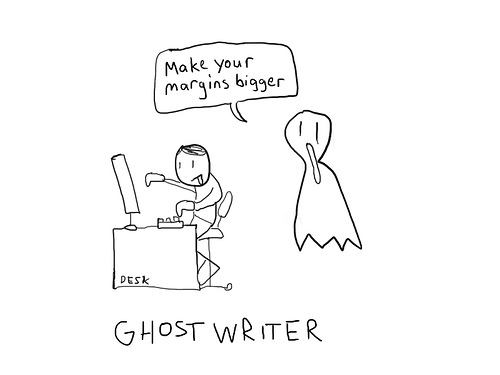 Most agencies employ ghost-writers who have a high academic degree. It is most likely that they are doctors or even professors having either made negative experiences with university or needing some extra income. Since an agency can earn up to 70 Euros creating one page of a manuscript, ghost-writing seems a quite lucrative job for some. If you submit a ghost-written manuscript and sign the declaration of academic honesty while handing it in, you have committed a punishable act that can be prosecuted by legal remedies. For example, as a student, you can be exmatriculated from your university. Universities mostly require a printed and an electronic version of student’s thesis and dissertation, since they can access special data bases comparing the student’s manuscript to already published articles to prevent plagiarism. Particularly since the political affaires around plagiarism major attention is drawn to it. Discovering that a university has awarded a degree for someone for a ghost-written thesis diminishes the institutions reputation considerably. Still, how to decrease ghost-writing?